Feline Pine is an all natural, environmental friendly cat litter that has stuck to its roots for over a decade. The dedication to providing us with a sustainable and easy to use cat litter has been their mission statement since 1992. Feline Pine uses no harsh chemicals, and is made from reclaimed all natural lumber shavings. No new trees are cut down to make any of their products! 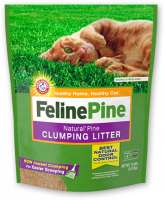 Feline Pine delivers a high-performance litter, never straying away from their belief in sustaining our environment and producing high-quality products.